Fingerlings became the must-have toy last year and have been all the rage ever since. They sold out everywhere and I remember parents struggling to find any for their little ones, it was crazy! Since the release of the original Fingerlings, they've gone on to release lots of different species, from unicorns and sloths to dinosaurs and dragons! It's exciting to know that the range hasn't stopped there though, as there are a new Fingerlings breed on the block! Pandas! At the moment there are three different Fingerlings Glitter Pandas to collect. Polly who is pink, Archie who is blue, and Drew who's a traditional looking panda in black and white. Noah was delighted to receive Archie for the purpose of this review, mainly because he has a friend who shares the same name! As you can see he is utterly adorable in different shades of blue, and a big tuft of fluffy white hair. Both kids wanted to smother him in kisses and cuddles as soon as he was out of the packet, and quickly realised they had to take turns! Fingerlings Glitter Pandas are utterly adorable and tons of fun, a lot like their Fingerlings siblings. They love to be held and to cling onto different things, especially fingers. They respond in lots of different ways, from noise, motion, and touch, making them a very interactive toy. They talk and sing, blink and blow kisses too. They even fall asleep when you rock them gently. Noah likes to make loud sounds to startle Archie, whereas Ava totally mothers him! 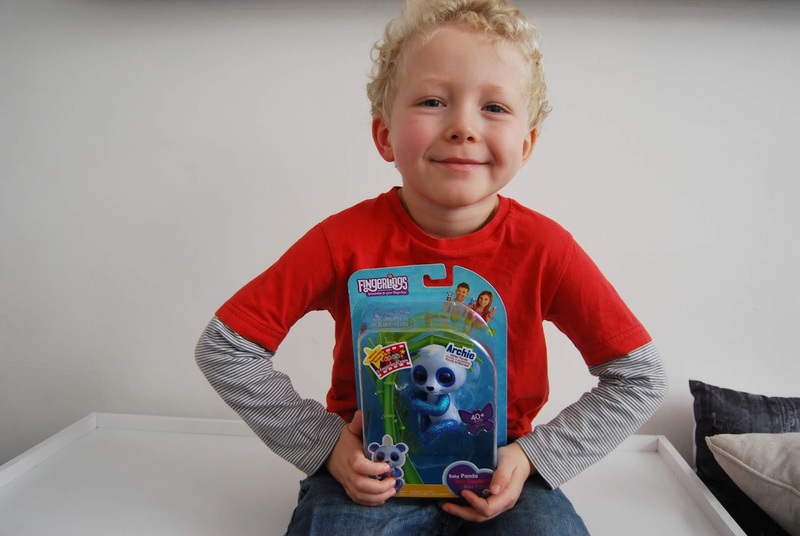 Fingerlings Glitter Pandas are suitable for children from 3 years of age, retail at a recommended retail price of £14.99, and are available to buy at Tesco. Now time for the giveaway. For your chance to win a Fingerlings Glitter Panda simply use the Gleam form below! Good luck and don't forget to enter my other blog competitions! 1. There will be 1 winner who win the prize mentioned above. Style may vary. I love Jojo the unicorn Fingerling! Ava has the monkey and he scares the living daylights out of me at night when she's left him on ;D Now she wants to collect them, my house is going to be overrun I can just see it! I love Jojo the unicorn. Luna as it is such a beautiful dragon & beautiful name too. My favourite is Luna the dragon! Jojo The Unicorn is my grandaughters favourite, its on her her Christmas list! Sadie loves Jojo the Unicorn but now she has seen this one . . . . I like the panda Drew but they're all so cute! I think Party is cute!! I love Drew. I think he looks calm and friendly. I think Molly is my favourite, I love her colour and her tail. My niece wants jojo the unicorn! Tough choice, but i'd have to say JoJo the unicorn. I like holly and jolly , the holiday ones. My son loves making his purple monkey sound like it is passing wind. Drew the black and white panda is my favourite! I love Luna, the little pink dragon. Like the name too. Luna is my favourite. I love dragons! We love the dinosaur fingerlings!